The Grant Museum’s collection of termites came to exist as result of the collaboration between Václav Frič and Enrique Vraz. 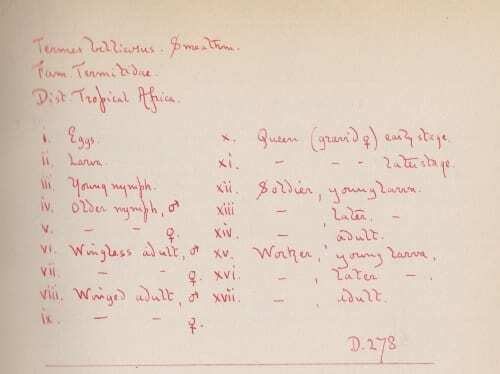 By 1886, Frič’s business enjoyed a favourable reputation as a resource for obtaining zoological and comparative anatomy specimens – stocking items to cater to both domestic and foreign private collectors and specialists (2). At this time, Vraz was beginning an extended expedition to West Africa (following a previous trip to North Africa) which would include Senegal, Ghana and the Ivory Coast during 1885-1888. 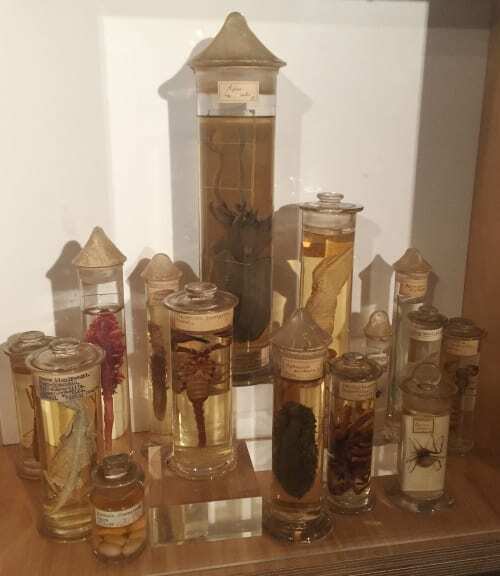 Frič wrote several letters to Vraz in Africa requesting various specimens including termites, and subsequently sent “crates with alcohol-filled glass containers” for Vraz to preserve specimens for shipment to Prague (3). Evidently, L74 and L79 were not found at the (unknown) time of this audit and this is correct as of today as the Museum has 15/17 original termite specimens. 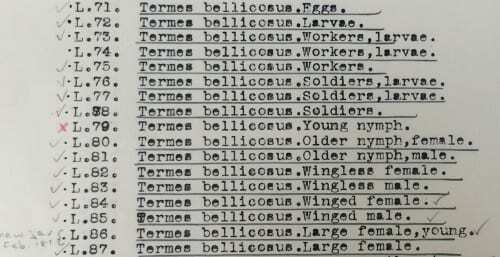 These catalogue lists which indicate the types of individuals representing the different castes within the termite colony serve as an insight into the meticulous efforts of both men. Frič had a particular interest in social insects which motivated his requests to Vraz. Vraz, in turn, must be given credit for his outstanding collecting skills (he also collected thousands of specimens which were later donated to the National Museum in Prague). Frič’s exhibition guides from the 1887 Wiesbaden scientific exhibition and the 1889 Paris World Fair (where he won a gold medal) highlight termite preparations that encompass stages of development, with caste representatives to demonstrate reproductive division of labour (4, 5). These are undoubtedly what we have at the Grant. I have written about the fastidiousness of Václav Frič (and his palaeontologist brother Antonín Frič ) elsewhere on the Grant Museum’s blog but it must again be mentioned specifically in the context of the termite specimens. 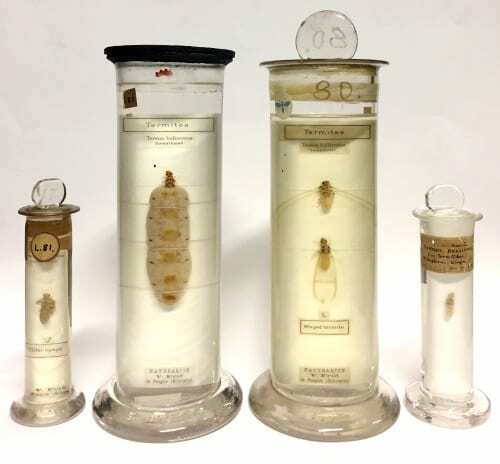 This propensity for exactitude is appreciable in the careful preparation of the termites such as in the above image showing worker larvae attached to a back-plate, within a vial covered with muslin, secured to a labelled secondary back-plate by twine, and sealed in a large glass jar. Reiling, Henri and Tat’jána Spunarová. 2005. “Václav Fricˇ (1839–1916) and his influence on collecting natural history”. Journal of the History of Collections Vol. 17 no. 1 pg. 29. Dreyfus, Ludwig (ed. ), 1887. Katalog zur wissenschaftlichen Ausstellung der 60. Versammlung deutscher Naturforscher und Aertze. Wiesbaden. p.187. Frič, Václav, 1889. Exposition universelle de 1889, à Paris: V. Frič, Naturaliste à Prague, 1544– II (Bohême Autriche). Prague. pg.1-4.